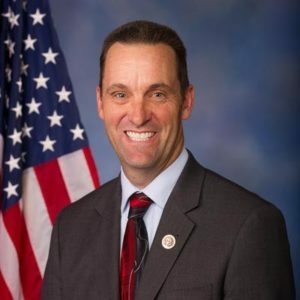 LOS ANGELES – In his bid for a third term in the 25th Congressional District, which covers the Antelope and Santa Clarita Valleys, Steve Knight [R-Palmdale] had broad support Tuesday night and easily cruised to the November runoff. With 100% of precincts reporting, Knight garnered 41,310 votes (52.8%). He was followed by Katie Hill (D), the executive director and deputy CEO of the homeless services nonprofit organization PATH, who received 15,833 votes (20.2%). Bryan Caforio (D), who narrowly lost to Knight in 2016, came in third with 14,305 votes (18.3%). Other Democrats in the race were Jess Phoenix, a geologist, who received 4,682 votes (6%); and businesswoman Mary Pallant, who received 2,075 votes (2.7%). It wasn’t immediately known how many late or provisional ballots remained to be counted over the coming days and whether they might affect the race for second place. [Read more here.] Only the top two vote-getters move on to the November general election. In California’s 23rd Congressional District, which includes portions of Lancaster, incumbent Kevin McCarthy (R) dominated the race with 56,089 votes (69.8%). His closest challenger was Tatiana Matta (D), with 9,416 votes (11.7%). Other candidates for the seat included Wendy Reed (D), who received 7,937 votes (9.9%); Mary Helen Barro (D), who received 4,275 votes (5.3%); James Davis (NP), who received 1,464 votes (1.8%); and Kurtis Wilson (D), who received 1,132 votes (1.4%). In Assembly District 36, which includes the Antelope Valley, Tom Lackey (R) received 24,491 votes (61.7%), while Steve Fox (D) received 15,220 votes (38.3%). California’s “top two” primary system guarantees that both Lackey and Fox will advance to the November election. View the full list of California Statewide Primary Semi-Official Election Results here. 3 comments for "Knight easily advances to November runoff"
LOL…they say he “easily advanced” as if he were not running unopposed. The question is whether a straight party line soldier in Trump’s war on California can beat a democrat in a district where even Hillary Clinton carried a majority. That will be an interesting question. I’m glad to see Katie Hill on the ballot. Caforio had too many things that the GOP knows how to weaponize to excite their deplorables. Katie Hill’s campaign annoyed me with the text messages and phone calls. Even told them that and got an ‘apology’ and told they would remove my name. Of course that did not happen. We all get flooded with mailers and commercials and such. Leave our phones alone is my simple request. Unfortunately the person who said they would remove your name should have truthfully told you that the phone list had been distributed to who knows how many callers at that point and getting you removed from all copies was a practical impossibility. Wouldn’t have made you happy, and understandably so, but at least it would have been true. Get ready though, because the RNC is going to dump an immense amount of money into trying to protect this district and their “party first, last, and only” boy Steve. I’d put my phone on screen, or turn it off entirely, except I make a point of keeping GOP boiler room callers on the line as long as possible to reduce their effectiveness. If I can manage to set up multiple GOP cars to give me a ride to the polls, so much the better.